The page to page redirect in .htaccess should only be used for pages within a website such as oldpage.html to newpage.html. Or oldpage.php to newpage.html. However, if you are getting a forward slash at the end of your “newpage.html/” then you may want to use the Sub-directory to Html rewrite rule instead. In addition, if you are getting dynamic URLs at the end of your redirect for example newpage.php?id=section1 then this would likely be a code-order problem, where the internal rewrite of the static URL to dynamic URL is occurring before the external redirect. Aliante Web Design Las Vegas is proud to announce the website for Blue Skies Consulting. Blue Skies signed up for web design and online marketing. 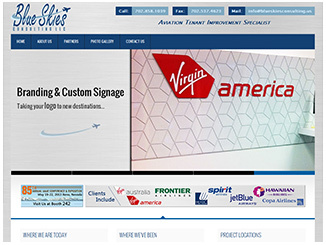 Blue Skies Consulting is an airline tenant improvement company specializing in aviation architectural millwork, airport millwork and gate counters solutions. They have worked for most of the major airlines such as JetBlue, United Air Lines, Southwest Airlines and Delta. They provide the best in airline project management. In 2013, Blue Skies started to offer custom Museum millwork. If you need great, professional custom airline or museum millwork work then call Blue Skies Consutling!